The rate should be quoted for full economy class fare inclusive of all taxes if any and it should be shortest/direct route. Paro-Bangkok-Paro and Paro-Delhi-Paro fare should be quoted separately. 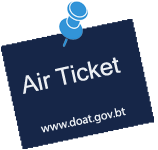 Airline and seats must be confirmed while submitting the quotation. The details of the traveler (s) will be provided in the work order. Any bids received by the purchaser after the deadline for submission of bids prescribed by the purchaser, will be declared “Late” and will be rejected and returned unopened to the bidder. Sealed quotation should be submitted to DoAT, Paro Airport on or before 17th March 2017 by 12 Noon and will be open on the same date at 2PM in presence of the bidder or their representative who chose to attend. For further information or any clarification please contact to the Administration and HR section at 08 270218 during office hours.